Ok. I understand from the posts above that one part of the tube could receive the regulated, 12V max, current (because it can't get more than 12.6V), while another part of the tube can handle stronger power, and thus could get unregulated power : am i correct ? Perhaps was a mistake of Mr Holt at the time to draw his schematic. The current is calculated as: (Vled-Vce)/Re and the Hfe of the transistor is irrelevant. thanks for your reply, I fully agree with you. A 12A_7 have two heaters (the part that lights up). The heaters have a "set" voltage to work. The 12 means 12V (12,6V actually), so you can wire the heaters in series and power them with 12,6V. You'll need to supply 150mA. But you can also wire the heaters in parallel, powering them with 6,3V but with 300mA. But this is just for the heaters, which, well, heats the tube, so it have the optimal temperature to work. The rest of the tubes works with way higher voltage, something like 200V or even more (but less tha 400V or 450V, I don't remember the maximom voltage a 12A_7 can handle). You can think this way: the tube it's something like a transistor, that can work with high voltage. But it have a "special on/off switch", that is the heater, which works with a specific voltage. The easiest way to get the voltage down to 12.6v is to put a resistor in series with it so the heater is 12.6v otherwise you will shorten the life of the heater (and the valve). Measure your heater voltage now, then subtract 12.6 from it and that is what you need to drop across the resistor. I would use a 2w resistor so it can dissipate the power without getting too hot. - connect lug 2 of the tone pot to ground. The schematic you've used have signal>tone pot>filter cap>ground path for the tone pot, while others have signal>filter cap>tone pot>ground path. Doing these things changes the path from the first option to the 2nd. Try and see if this fixes this issue. Also, if you think it's working in reverse, just move the wire from lug 3 to lug 1. I just tried it tonight : it works perfectly as expected now, thank you very much. I also tried the bass boost circuit, but i didn't hear any difference. I will install a regulator next week. 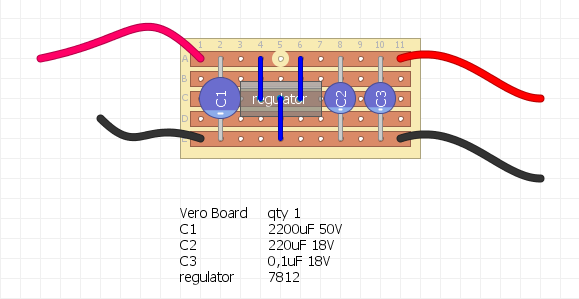 I'm planning to add the 12V regulator for the heater from a veroboard : as it is the first time i'm designing a veroboard, could anyone tell me if the schematic is correct, please ? Also, someone wrote that the first capacitor value (2200µF) was "overkill", but i just borrowed the values from a schematici found on the web : which value would be better for this circuit ? Little bump : is this veroboard schmeatic correct ? I would use 100uF 50V for C1 and something between 10uF and 100uF 25V for C2. I'm dully noting your suggested values for the capacitors. 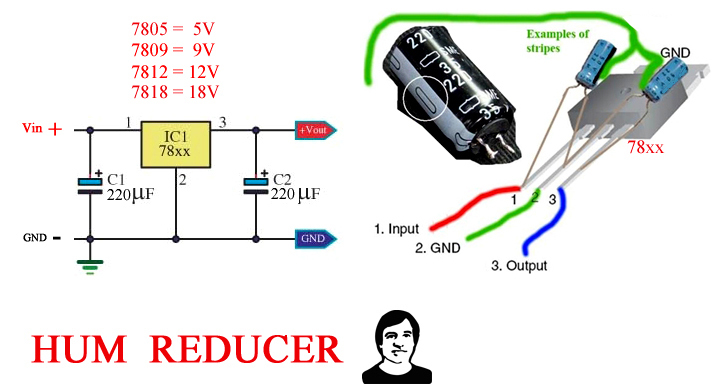 What about the "hum reducer" circuit (avoiding a veroboard) ? Would it end to be the same ? 1- What will the values of C1 and C2 change (why chosing 100µF instead of 220µF or another value) ? 2- I have read that starved plates designs expect a very high input impedance load : should i include a buffer inside the enclosure, before the circuit ? The values sets how much filtering you'll have. In most cases, they're not too much critical. That "hum reducer" is basically the same circuit but without a board; you can do this way, but there'll be lots of parts' leads exposed, so it's easy to get some circuit shorts. From what i see, there is no cut on the veroboard you posted, right ? Yes, no cuts. And you can use 35V caps, just don't power it with more than 35V. If you're still using 15V, there's no problem. - For C1, i have a 220µF 35V Nichicon cap, and a 100µF 35V Nichicon cap : so, you're saying that the 100µF will work best ? - For C2 i have a 47µF 25V Nichicon cap : i guess it's perfectly bewteen the 10 and 100 values you suggested. I can also wait a bit more, and buy the best values. Could you tell if the filtering will be worse if i increase or decrease the capacitor values ? If you decrease: less filtering and more power supply noise. If you increase: more filtering and less power supply noise. But there's a point you won't notice any difference if you increase the cap value. I'd try with the values you have in hand. Any value for C1 and 47uF for C2, or 220uF for C1 and 100uF for C2. - first, it didn't work (but it was because while installing it, one resistance on the valve socket got unsoldered on one side). Then, i unsoldered the regulator board, and tried with the previous settings (no regulator board) : it worked again. typical circuit for the 78xx should be like the pic below. The capacitors close to the 78xx are only for blocking of HF oscillating, the values described like above look not correct. Keep in mind, if voltage Uxx on output get's higher than the input voltage UE, the 78xx will die immediately. So use the diode for protection. Hope you have protection against my bad English. Hi, 95H, thank you for your answer. I didn't use a diode, and used only 2 capacitors (electrolytics). So, it might be a dead 7812... I will order a couple more, to try with a diode and different cap values (as well as a third capacitor). In the meantime, I will try to "translate" the circuit schematic into a veroboard.